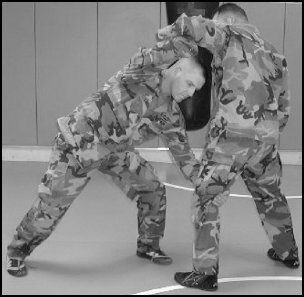 Before progressing into takedowns and throws, soldiers must learn how to fall to the ground without getting hurt, both during training and during combat. 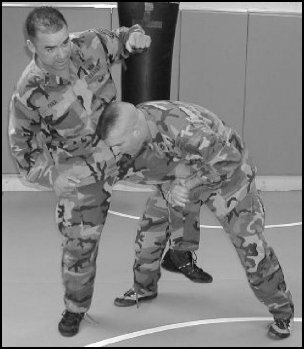 Each practice repetition of a throw or takedown is a chance for the training partner to perfect his breakfalls. The most important point during breakfall training is to not try to catch yourself by reaching out with your arms, but to take the impact of the fall on the meaty portions of the body. 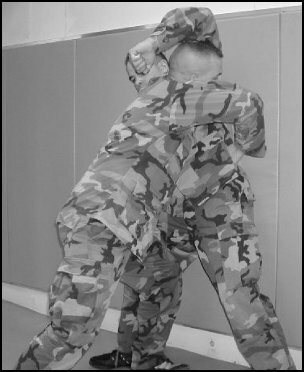 After initial training on breakfalls has been conducted, it must be followed up with refresher breakfall training before training on throws and takedowns. This can be accomplished easily by making it part of your warm-up. a. 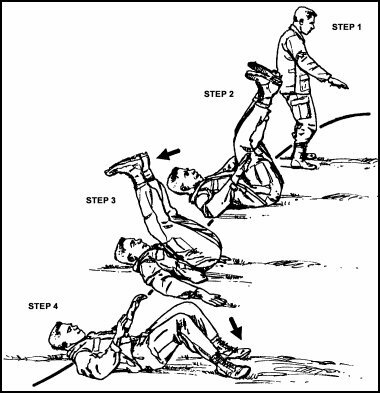 Side Breakfall Position (Figure 5-1). 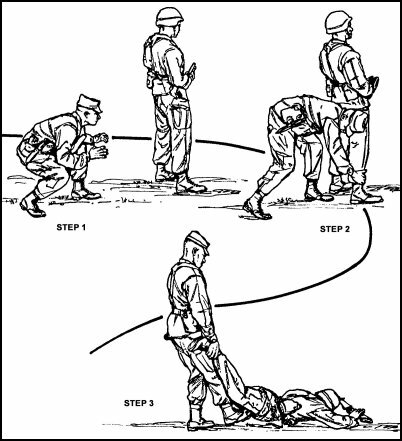 Before training on breakfalls can take place, soldiers must understand the basic breakfall position. 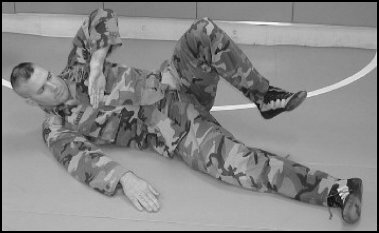 Laying on his left side, the soldier extends his left leg and bends his right leg, raising his right leg off the ground. His left arm is extended, palm down, slightly away from his side. His right arm is bent in front of his face to defend against attacks. This should be practiced on both sides. Figure 5-1. 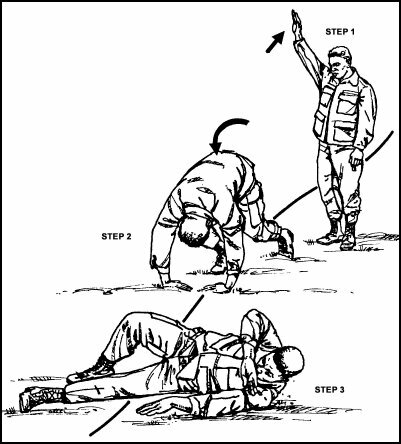 Side breakfall position. b. 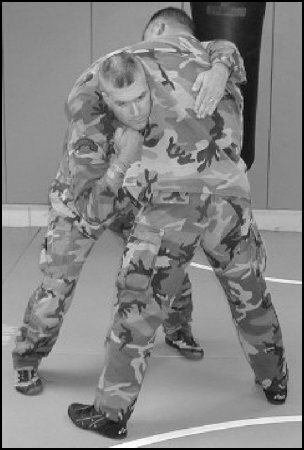 Forward Rolling Breakfall from the Kneeling Position. 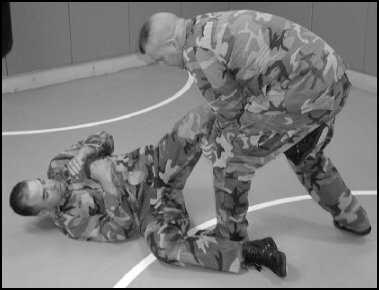 After soldiers are familiar with the side breakfall position, the best way to introduce them to the mechanics of falling is by starting them on their knees. (1) Step 1 (Figure 5-2). The fighter assumes a kneeling posture with his left arm raised in the air. He places his left arm across the front of his body, palm down, outside of his right knee. Figure 5-2. 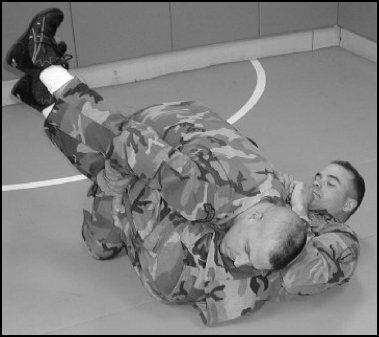 Forward rolling breakfall from the kneeling position, step 1. Figure 5-2. 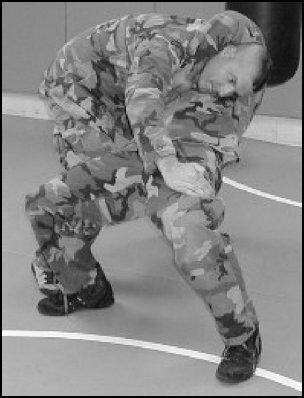 Forward rolling breakfall from the kneeling position, step 1 (continued). (2) Step 2 (Figure 5-3). 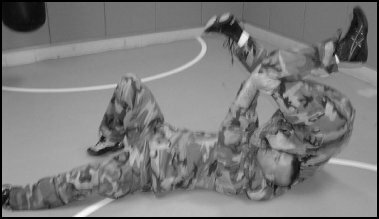 He rolls over his left shoulder, along his arm, landing on his right side with his right leg extended in the right side breakfall position. Figure 5-3. 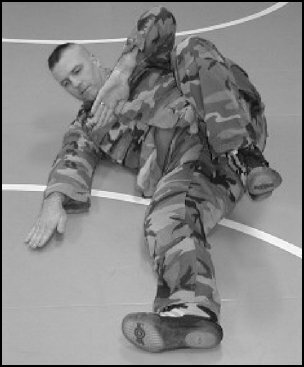 Forward rolling breakfall from the kneeling position, step 2.
c. Forward Rolling Breakfall (Figure 5-4). 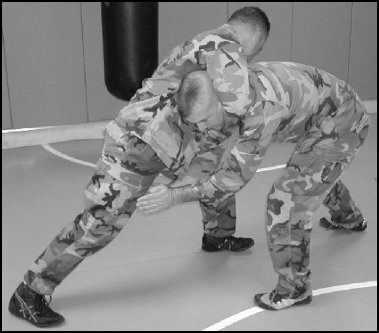 When soldiers have mastered the forward rolling breakfall from the kneeling position, they will progress to the standing position. (1) Step 1. 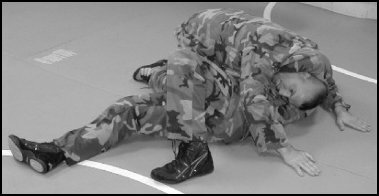 The soldier starts the fall from the standing position. He raises one arm to expose his entire side, places both hands on the ground, and bends both knees. (2) Step 2. He rolls forward across the body along the hand, arm, and back to the opposite hip. (3) Step 3. He ends in a good side breakfall position. Figure 5-4. Forward rolling fall. d. Rear Breakfall (Figure 5-5). There are also many times when a fighter will take a fall straight down to his back. (1) Step 1. 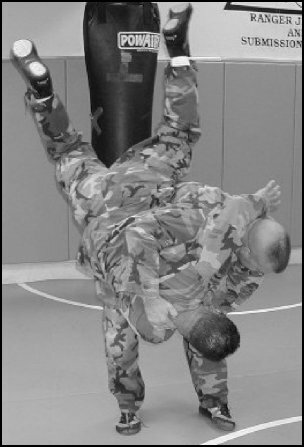 The fighter starts the fall from the standing position and keeps his head forward to reduce the chance of head and neck injuries. (2) Step 2. He then falls backward and lowers his center of gravity by bending both knees. As his buttocks touch the ground, he rolls backward to absorb the momentum of the fall. (3) Step 3. He keeps his hands cupped and slaps his hands and arms down to help absorb the shock of impact and to stabilize his body. Controlling a standup fight means controlling the range between fighters. The untrained fighter is primarily dangerous at punching range. The goal is to avoid that range. Even if you are the superior striker, the most dangerous thing you can do is to spend time at the range where the enemy has the highest probability of victory. When training soldiers, the primary goal should be instilling the courage to close the distance. 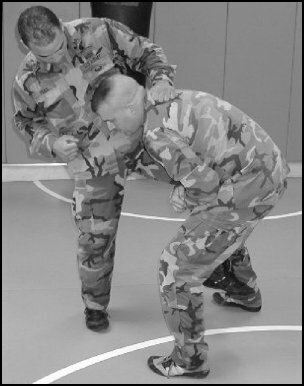 Recognizing that standup fighting skills are difficult to master in a short amount of time, compare takedowns to the basic tackle. The following techniques are essentially a more sophisticated way to tackle the enemy. a. The Clinch. 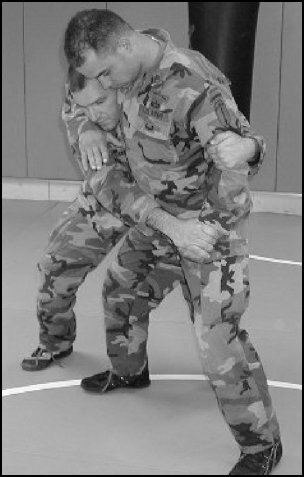 The clinch position is the optimum way to hold an enemy after you have successfully closed the distance, but have not yet executed a successful takedown. 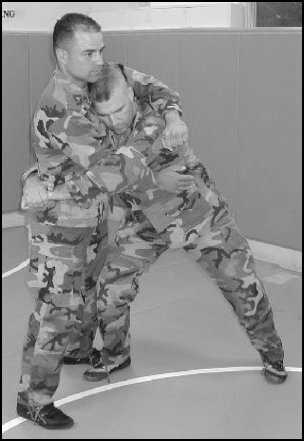 While in the clinch, you have control of the enemy's far side arm at the elbow, with the arm also tucked into your armpit. Your head is tucked into the enemy's chest, and you hand is around his waist, controlling his hip. Your legs are sufficiently back to prevent him from getting his hips under you to attempt a throw. There are two ranges where confrontations start. (1) Close Range. This occurs when the enemy is within striking range. (a) Step 1 (Figure 5-6). 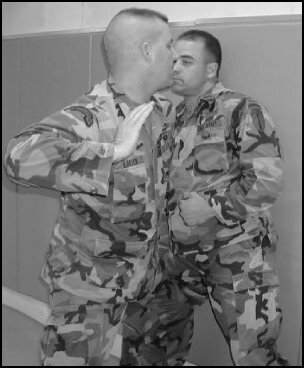 When a confrontation seems likely, you will face the potential enemy and bring your hands up in a non-threatening manner. (b) Step 2 (Figure 5-7). When the enemy attacks, change levels by pulling both feet up and placing them out in a broad stance. Simultaneously bring both arms up to cover the most dangerous possible attacks. It is important not to anticipate the means of attack, but to cover for the most dangerous potential attacks. Therefore both arms should come up every time. Figure 5-6. The clinch, step 1. Figure 5-7. The clinch, step 2. (c) Step 3 (Figure 5-8). To clinch, reach over the far side arm and pull it down into your armpit, controlling it at the elbow. 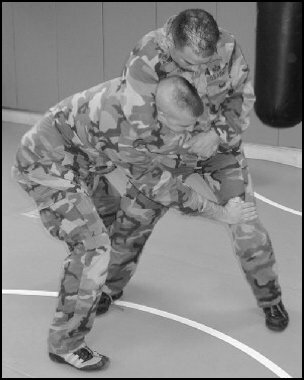 Simultaneously step around to the other side and drive your other elbow under his arm until you can reach around his waist and achieve the clinch. Figure 5-8. The clinch, step 3. (2) Long Range. It is more common for a confrontation to start outside of striking range. Having the courage to close the distance is the principle training goal. (a) Basic Long Range. From a fighter's stance, at an opportune moment, drive into the enemy. Try to place your forehead on his chest. You should keep your head up so that your forehead is pointed at the enemy and your hands should go just over his biceps. From this position, achieve the clinch as before. (b) Long Range when the Enemy Attacks. If the enemy tries to initiate the attack with punches, use this opportunity to close the distance. He will be closing the distance to get into punching range, therefore clinching will be that much easier. (c) Long Range with a Kick. If the enemy is content to stand back and await your attack, you will need to gain some form of advantage before closing the distance. One way to do this is with a kick. 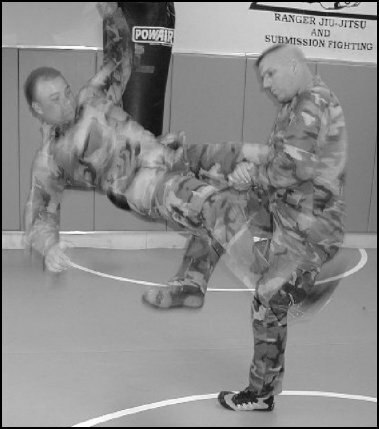 The kick should be with the front leg, and should be aimed at the enemy's thigh. It is important that if you miss the kick, your leg should fall in front of the enemy so that you do not give up your back. All of the throws and takedowns in this section assume that you have already achieved the clinch. It is important to remember that most sport-type throws are executed at what, in a real fight, would be striking range. a. Basic Takedown. This is the basic tackle. (1) Step 1 (Figure 5-9). 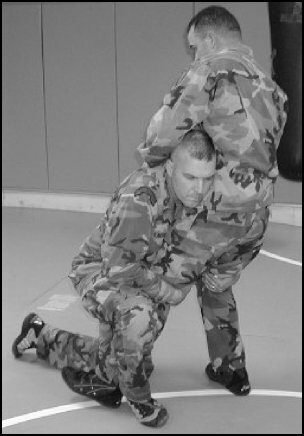 From the clinch, step slightly to the front of the enemy and change your grip. Both palms are pointed down and your hands are at the enemy's kidneys. Figure 5-9. Basic takedown, step 1. (2) Step 2 (Figure 5-10). 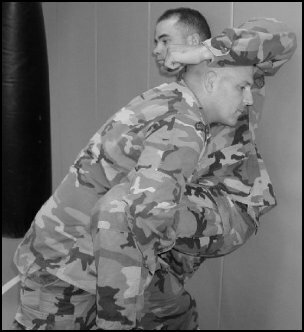 Pulling with your hands and pushing with your head and shoulder, break the enemy's balance to the rear. Figure 5-10. Basic takedown, step 2. (3) Step 3 (Figure 5-11). Step over the enemy and release your grip, ending in the mounted position. Figure 5-11. Basic takedown, step 3. It is very important to release your hands to avoid landing on them. b. Hook the Leg (Figure 5-12). If the enemy attempts to pull away, use your leg closest to his back to hook his leg. When he begins to fall, release the leg and finish as before. Figure 5-12. Hook the leg. c. Hip Throw. The enemy may attempt to avoid the tackle by leaning forward. (1) Step 1 (Figure 5-13). With the leg that is behind the enemy, step through until you are standing in front of him with your legs inside of his. Your hip should be pushed well through. Figure 5-13. Hip throw, step 1. (2) Step 2 (Figure 5-14). 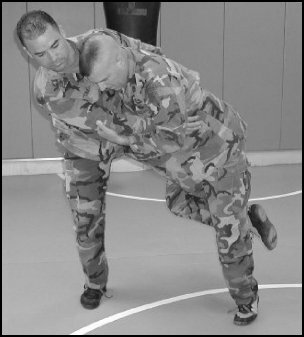 Using a scooping motion with your hips, lift the enemy and throw him over your hip. You should land in the knee mount or side control. Figure 5-14. Hip throw, step 2. Figure 5-14. Hip throw, step 2 (continued). 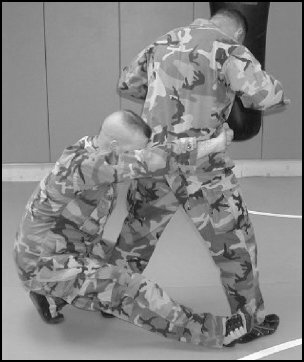 d. Rear Takedown (Figure 5-15). Frequently, you will end up after the clinch with your head behind the enemy's arm. When this happens, you grasp your hands together around his waist by interlocking your fingers, and place your forehead in the middle of the small of his back to avoid strikes. From this secure position, you can attempt to take the enemy down. (1) Step 1 (Figure 5-16). Step to one side so that you are behind the enemy at an angle. Figure 5-16. Rear takedown, step 1. (2) Step 2 (Figure 5-17). With the leg that is behind the enemy, reach out and place the instep of your foot behind the enemy's far side foot so that he cannot step backward. Sit down as close to your other foot as possible and hang your weight from the enemy's waist. (3) Step 3 (Figure 5-18). The enemy will fall backwards over your extended leg. As he does so, tuck your elbow in to avoid falling on it, and rotate up into the mounted position. Figure 5-18. Rear takedown, step 3. Figure 5-18. Rear takedown, step 3 (continued). (1) Step 1 (Figure 5-19). When you find yourself caught in the guillotine choke, reach over the enemy's opposite shoulder with your arm. 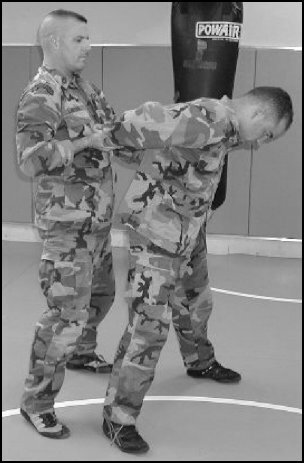 Turn your head slightly inward and grasp the enemy's wrist to help alleviate the pressure. You should also relax and hang as dead weight. If the enemy is taller than you, place your knees on his thighs to support you. Figure 5-19. Defend the guillotine, step 1. (2) Step 2 (Figure 5-20). As the enemy tries to pick you up to choke you, bounce around to the opposite side from the choke. 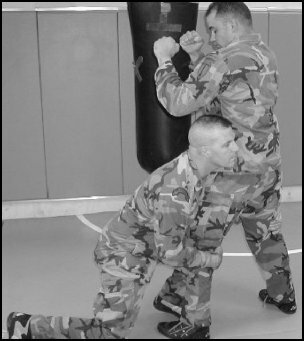 Break his base by bumping the back of his knee with your knee, and lower him carefully to the ground. 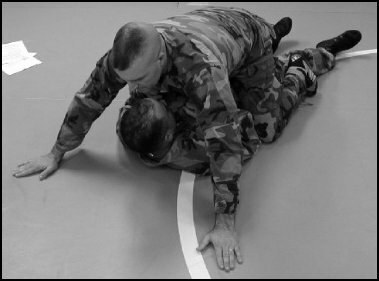 Ensure that you are in side control as you set him down. Figure 5-20. Defend the guillotine, step 2. Figure 5-20. Defend the guillotine, step 2 (continued). (3) Step 3 (Figure 5-21). 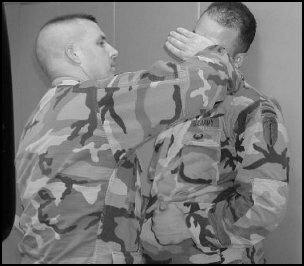 With the hand that is closest to his head, grasp his far side shoulder and drive the bony portion of your forearm under his chin until you can pull your head free. Figure 5-21. Defend the guillotine, step 3.
b. Defend the Guillotine with Knee Strikes. 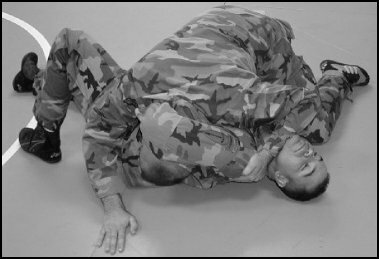 When the enemy has secured the guillotine choke, he may attempt to direct knee strikes to your head. (1) Step 1 (Figure 5-22). With both arms locked out at the elbows, and the heels of the hands together, block the enemy's knee strikes just above the knee. It is very important that your thumbs be alongside your hands so that they are not broken by the enemy's knee strikes. Your leg that is on the side corresponding with the side of the enemy that your head is on, should be forward, and the other leg back. Your leg that is on the same side of the enemy as your head should be forward, and your other leg back. Figure 5-22. Defend the guillotine with knee strikes, step 1. (2) Step 2 (Figure 5-23). Swing your back leg forward, between the enemy's legs, and sit down on your other heel. This dropping action will send the enemy over your head, driving his head into the ground. Figure 5-23. Defend the guillotine with knee strikes, step 2. Figure 5-23. Defend the guillotine with knee strikes, step 2 (continued). This technique can be very dangerous to practice. It should always be practiced with the enemy's outside hand free, allowing him to roll out. 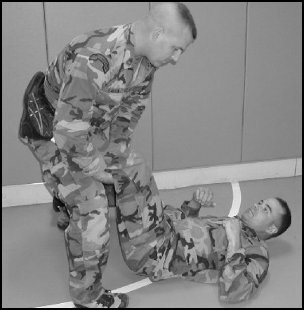 Soldiers should be proficient in rolling breakfalls, and great care must be taken to ensure they know how to properly roll out while practicing (Figure 5-24). Figure 5-24. Defend the guillotine with knee strikes, caution. c. Headlock with Punches. When you are behind the enemy and he has control of your head, He must release one of his hands in order to punch. (1) Step 1 (Figure 5-25). 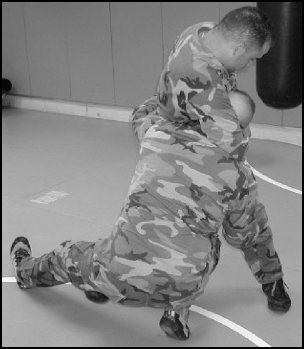 With your front arm attempt to grasp the enemy's punching arm and push it back, feeding it to your other arm. Grasp it from behind his back at the elbow. Figure 5-25. Headlock with punches, step 1. (2) Step 2 (Figure 5-26). 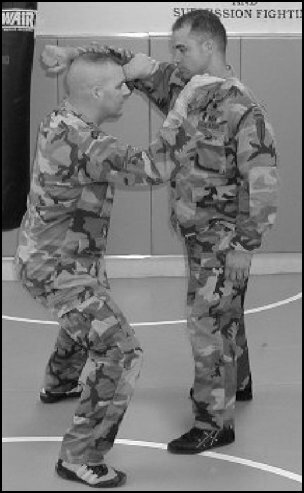 When the punching arm has been controlled, secure a grip on the top of the hand that is around your head, and place your hip against the enemy's side. At the same time, step and look away from the enemy, extending your body to break his grip. Hip pressure will keep him from following. Figure 5-26. 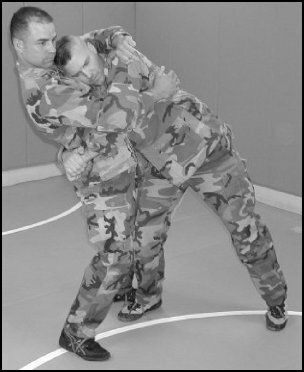 Headlock with punches, step 2. (3) Step 3 (Figure 5-27). Keep his hand pressed tightly against your chest, and with the foot closest to him, step backwards to place yourself standing behind him with his hand still captured against your chest. Figure 5-27. 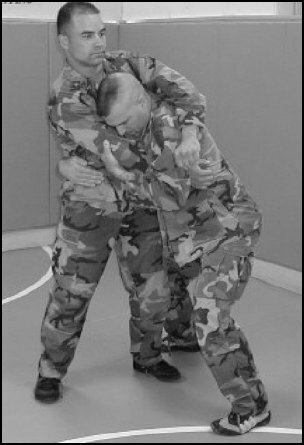 Headlock with punches, step 3. Figure 5-27. 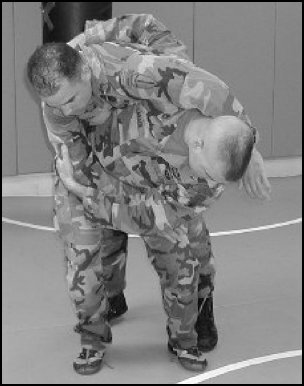 Headlock with punches, step 3 (continued). d. Head Lock Without Punches. When the enemy has control of your head, he will normally try to hold on with both hands. (1) Step 1 (Figure 5-28). 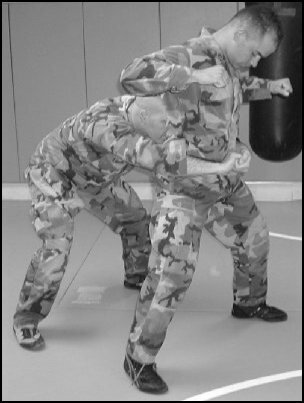 Block potential knee strikes by placing the heel of one hand just above the opposite side knee. 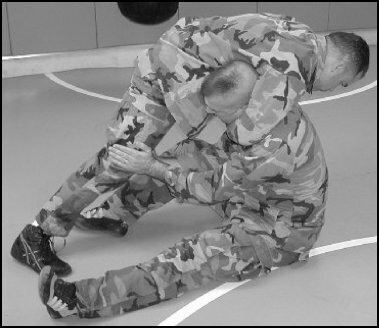 Reach the other hand around the enemy's back and secure a grip at the far side of his hip bone. Your legs should be back so that he cannot get his hip under you. Figure 5-28. Headlock without punches, step 1. (2) Step 2 (Figure 5-29). Step slightly in front of the enemy, and then with your outside foot, step between the enemy's legs and sit down on your heel. This should be a spinning action, and as you drop between his legs, pull him with the hand that was on his hip. He will fall over you so that you can roll up into the mount. Figure 5-29. Headlock without punches, step 2. Figure 5-29. 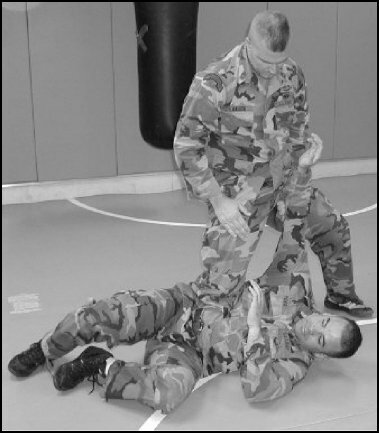 Headlock without punches, step 2 (continued). Ensure that you tuck your elbow in as he falls to avoid landing on it. 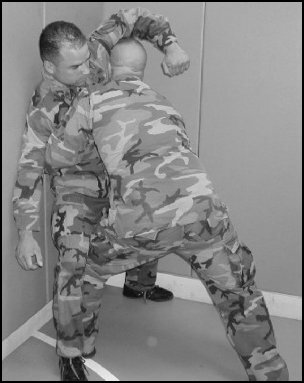 If you are having difficulty gaining control of the enemy, a good technique is to push him against a wall. a. Position and Strikes (Figure 5-30). Push him against the wall with one shoulder. One arm should be around his waist, and the other one should be on the inside of his knee to deflect knee strikes to your groin. One of your legs should be back to push, and the other one should be inside of the enemy's knee to deflect knee strikes. 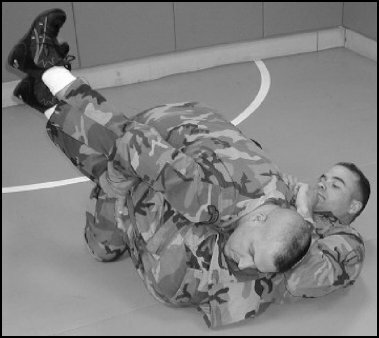 From this position, you can deliver strikes to the enemy's ribs by turning your hand over and attacking with the knuckles. When he attempts to cover his ribs, with a sharp movement, push your shoulder into him to gain enough space to strike his head. Figure 5-30. Position and strikes against the wall. Figure 5-30. Position and strikes against the wall (continued). b. Leg Drag (Figure 5-31). When the enemy attempts a knee strike on the side you are facing, capture his leg. Step back with the foot on the same side pulling him from the wall. Figure 5-31. Leg drag (continued). Going under the enemy's arms and straight to the legs is a very useful type of attack. There are several ways to finish depending on the enemy's actions, but the initial attack is the same. 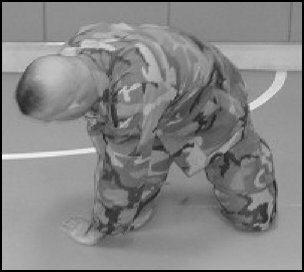 When you find yourself relatively close to the enemy, change your level by bending both of your knees and drive into his midsection with your shoulder (Figure ;5-32). One of your feet should penetrate as deep as the enemy's feet. Continue to drive and control the legs to end in side control. Figure 5-32. Double leg attack. Figure 5-32. Double leg attack (continued). a. Finishes from the Double Leg Attack. (1) Lift (Figure 5-33). By driving your hips under him and arching your back, lift the enemy up. 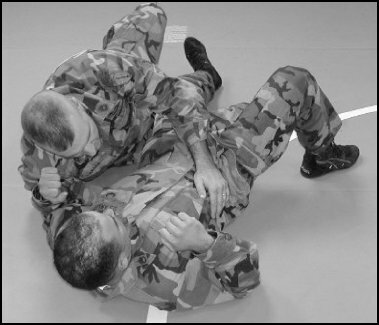 Push up with your head and, by controlling his legs with your arms, gain side control. b. Hook the Leg (Figure 5-34). Hook the enemy's heel with your outside leg and continue to drive through him. Figure 5-34. Hook the leg. You may also choose to attack only one leg (Figure 5-35). 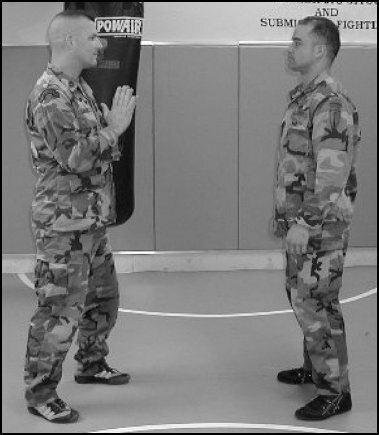 Making a deep step with the inside leg, and reaching with the same side arm to the enemy's opposite knee, step to the outside and grasp your hands together behind his knee. Your head and shoulder should be tight against his thigh. 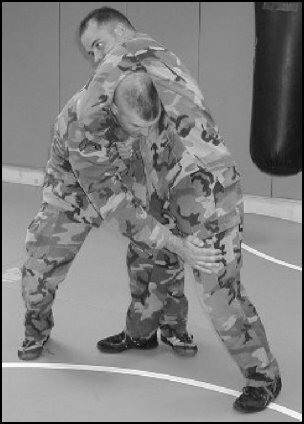 Moves to finish a single leg attack include the dump, block the opposite knee, and the leg sweep. Figure 5-35. Single leg attack. Figure 5-35. Single leg attack (continued). a. Dump (Figure 5-36). From the single leg position, with your shoulder tight against his thigh, take a short step in front of him, and then a longer step backward with your trail foot. Pressure from your head and shoulder will "dump" him on to his buttocks. b. Block the Opposite Knee (Figure 5-37). 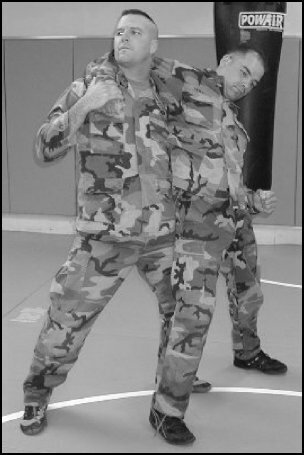 If the enemy turns away from you, maintain control of his leg and reach between his legs to block his opposite leg. Use pressure with your shoulder on the back of his leg to bring him face down on the ground. Figure 5-37. Block the opposite knee. 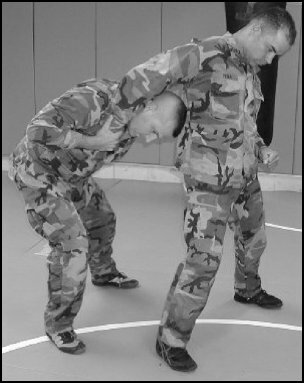 c. Leg Sweep (Figure 5-38). Reach your outside arm under his leg and with your outside hand reach down and gain control of his ankle. 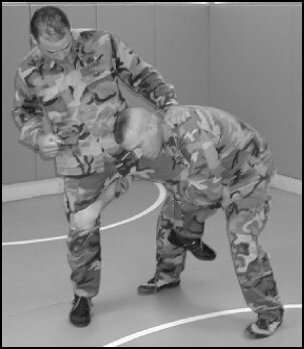 Pull his leg up with both of your arms and use your foot to sweep his post leg. 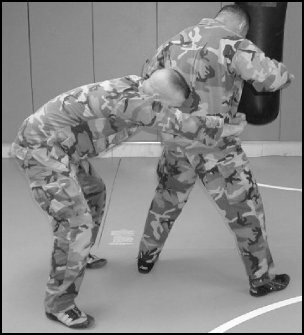 In the rear attack, the unsuspecting is knocked to the ground and kicked in the groin, or rear mounted. The soldier can then kill the sentry by any proper means. 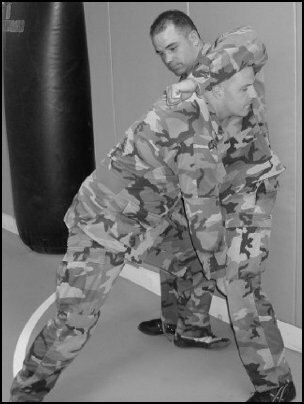 Since surprise is the essential element of this technique, the soldier must use effective stalking techniques (Figure 5-39, Step 1). To initiate his attack, he grabs both of the sentry's ankles (Figure 5-39, Step 2). Then he heaves his body weight into the hips of the sentry while pulling up on the ankles. This technique slams the sentry to the ground on his face. 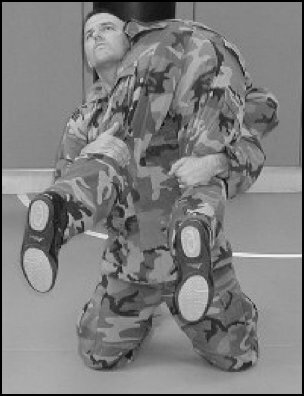 Then, the soldier may follow with a kick to the groin (Figure 5-39, Step 3) or by achieving the rear mount. Figure 5-39. Attack from the rear. Copyright © 2000-2019 GlobalSecurity.org All rights reserved.